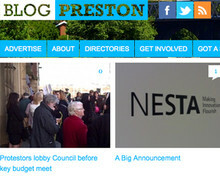 Hyperlocal site Blog Preston has won a joint bid in the NESTA Neighbourhood Challenge to trial a project developing community journalism and providing people with the facilities to produce their own content. The site joined forces with a number of other media projects and charities in the Preston area last year to bid for funding in NESTA's (National Endowment for Science, Technology and the Arts) challenge, including community development charity Prescap, Preston FM and the Bespoke Project at the University of Central Lancashire. After being shortlisted from more than 600 applicants, the project was chosen as one of 16 to be trialled over the next year, recruiting and training citizen journalists in Deepdale, Ribbleton and St Matthews. "This is great news not just for Blog Preston but Preston as a whole," founder of Blog Preston Ed Walker said today in a post on the site. "It means we'll be able to expand our coverage of the city and into communities we've perhaps found it difficult to cover before. "We hope to see a greater range of content on the site as a result of this partnership, and it's great it's happening as we approach the Preston Guild in 2012 which is a huge event for the city. "Our bid is about communities. It's about recognising that communities are made up of people talking to one another. It's about finding out what a community already has and what it still needs before exploring how to supply it. The people best placed to do this are the communities themselves." Led by Prescap the hyperlocal site said the project will aim to provide communities with the tool-sets, support and facilities to help them create their own content and set their own news agendas. "Community produced radio and TV, descriptions from blogs, comments, reactions and websites constitute an ideal foundation for neighbourhoods to find out about issues pertinent to them and to find out what local social groups are up to," the post adds. "Their output may be little more than news and information about their own group activities, but it may evolve into forms of media that translate into campaigning public journalism, connecting people from diverse backgrounds with shared interests to resolve an issue or to collaborate on improving their lot."